Magnolia Cottage was built in the late 16th Century and rebuilt in the 18th Century. It has a decorative brick front with part timber frame to gable ends with a painted render infill, and a central chimney on the ridge. 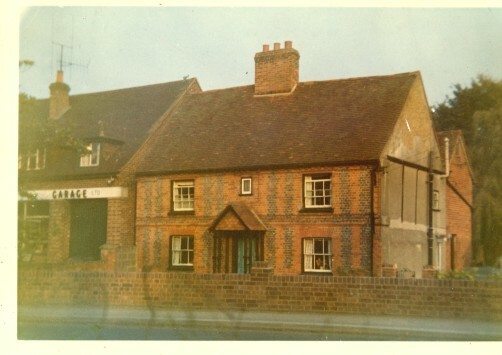 This photo taken in 1963 shows the timber frame. An earlier black and white photo from 1957 shows a front view. 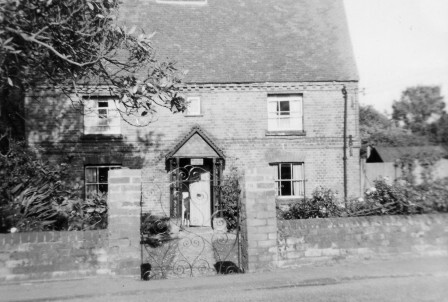 George Bentley, who ran Arborfield Garage, lived in this house, while his sons lived next door in the two Whitewell cottages. Click here to see some images of Whitewell Cottages taken at John Bentley's funeral. Magnolia Cottage was home to the Bentley family for almost two centuries, Robin Bentley being the last family occupant when he sold the cottage in 1968. In the story by Guy Bentley, "Arborfield Street 1910", that the front room was a doctors’ surgery. In the late 19th century the Vincents lived here, working as an Agricultural Implement Maker and Wheelwright, and there is a well-known postcard of a Romany Caravan built by them in Arborfield. They also made Agricultural carts. Whitewell Cottages appear to have been built around 1870 to 1880, and were later the homes of Guy and John Bentley. The doctor’s surgery moved into the extension of the cottage nearest Magnolia. The cottages were pulled down in the late 1960’s to make way for Whitewell Close. Guy and Nell Bentley eventually moved out of their cottage to live more or less on the same site - in Whitewell Close. Many thanks to the Bentley family for providing these and other photos.